(Nanowerk News) Researchers of the Institute of Biotechnology and Biomedicine (IBB-UAB) have achieved to generate 4 peptides -molecules smaller than proteins - capable of self-assembling in a controlled manner to form nanomaterials. The research, published in the journal ACS Nano ("Minimalist Prion-Inspired Polar Self-Assembling Peptides"), was conducted by Salvador Ventura, Marta Díaz and Susanna Navarro (IBB-UAB), and included the collaboration of Isabel Fuentes and Francesc Teixidor (Institute of Materials Science of Barcelona (ICMAB-CSIC). 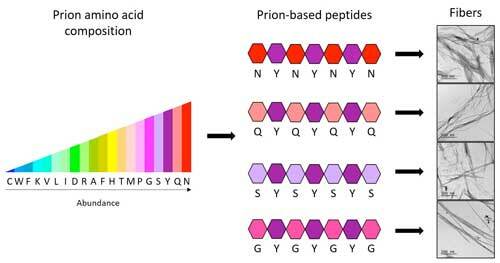 With the new heptapeptides, researchers from the IBB-UAB demonstrate that only four different types of amino acids, distributed in a specific manner and combined always with another fifth type, are enough to obtain the complete code needed to form synthetic prion fibres.